Wildlife researcher Brian Kubicki has identified a new species of glass frog that bears a striking resemblance to everyone's favorite childhood frog. 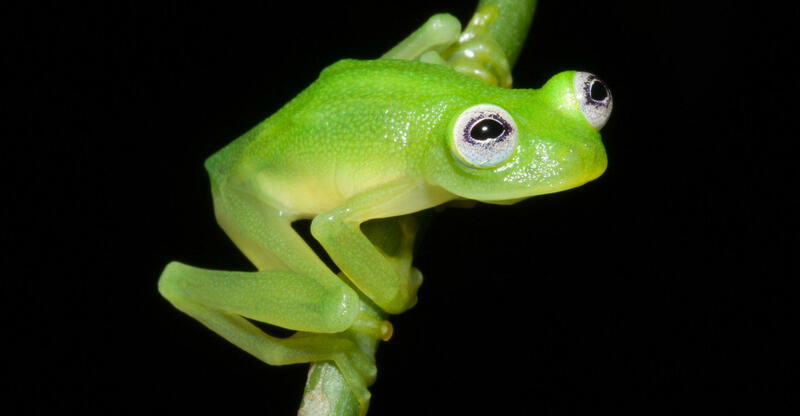 Discovered in Costa Rica, Hyalinobatrachium dianae is easily identifiable by its lime green flesh, translucent underside and large, Kermit-like eyes. H. dianae was discovered in the Talamanca mountains; it is the first new species of glass frog to be discovered in Costa Rica in over 40 years. Kubicki posits that the frog remained hidden from researchers for so long thanks to its mating call, which more closely resembles that of insects than frogs. No word yet if there is a Miss Piggy look-alike pig also residing in the same jungle. To put themselves in the best position to find a mate, these frogs battle it out in the jungle.